He now spends his time going after other species and is a devotee of "catch and release". He has learned to tie his own flies and is experiencing new frontiers in fishing recently catching his first Peacock Bass in the south Florida Canals. His dream is to go to Patagonia. The FLORIDA LARGEMOUTH BASS is the best known and most popular freshwater game fish in Florida. Found statewide, largemouth bass have excellent growth rates, particularly in the productive waters of central Florida. Spring is the best time of year to catch bass, when fish move into shallow water to spawn. All Florida populations of striped bass are river dwellers rather than anadromous (normally living in salt or brackish waters, but entering freshwater streams to spawn). The species has been widely introduced in numerous lakes, rivers and impoundments throughout the world. Stripers prefer relatively clear water with a good supply of open-water baitfish. Their preferred water temperature range is 65 to 70 degrees. 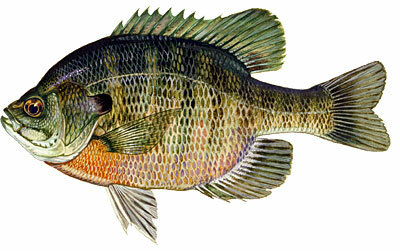 Spawning Habits - Spawns in March, April and May when water temperatures reach 60 to 68 degrees. Channel catfish are abundant throughout Florida, spawning in holes and crevices in flowing water. Channel catfish may exceed 40 pounds, although the typical size is less than five pounds. Butterfly peacocks are caught only during daylight hours, as they do not feed at night.